A sensitivity to the designed dimension of objects and systems, along with the inclination and capacity to shape one’s world through building, tinkering, re/designing, or hacking. Learning to notice and engage with one’s physical and conceptual environment by looking closely and reflecting on the design of objects and systems, exploring the complexity of design, and finding opportunity to make objects and systems more effective, more efficient, more ethical, or more beautiful. 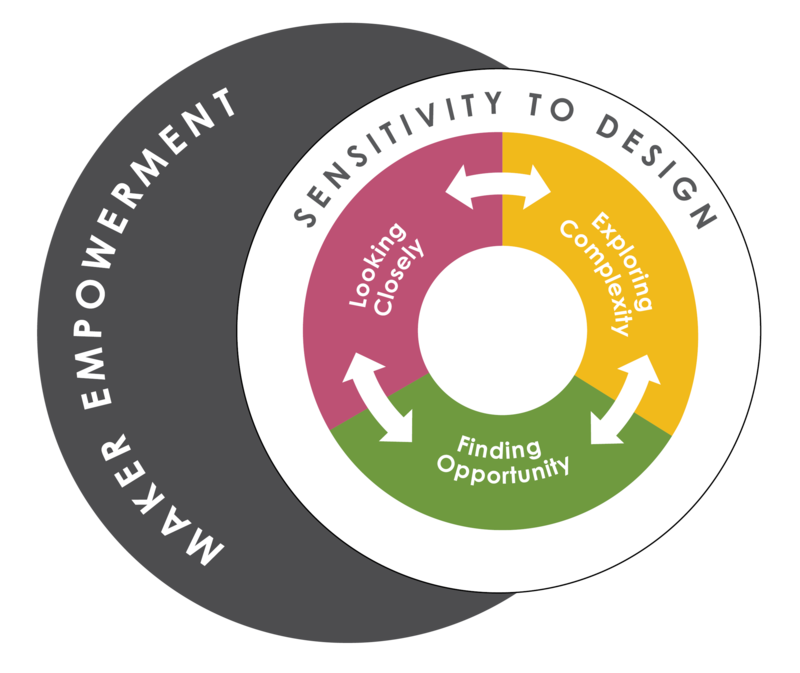 For each of these capacities, there is a set of observable “moves” ­—or indicators — that learners and educators can use to help design maker-centered learning experiences, and to support, observe, document, and assess maker-centered learning. They apply to individual as well as collaborative learning. 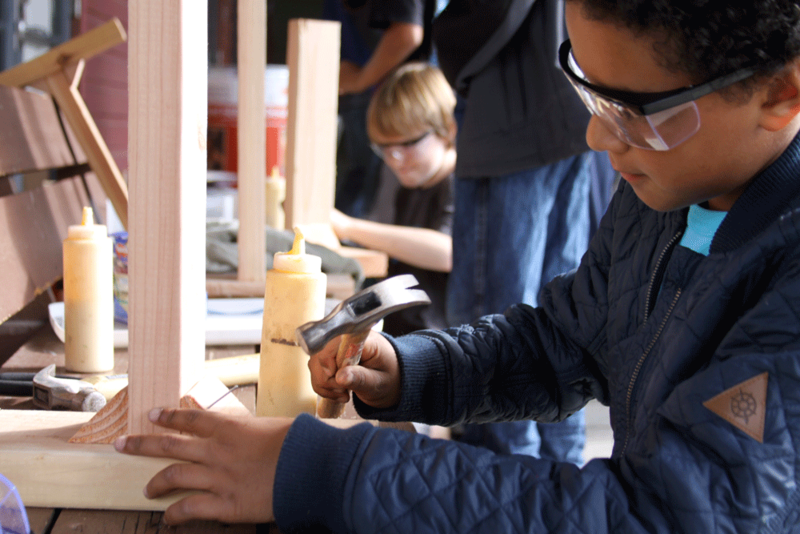 Explore the maker capacities and the moves/indicators below. Looking carefully at objects and systems in order to notice their intricacies, nuances, and details. By looking closely, one may begin to see the complexities inherent in objects and systems. WHAT ARE THE MOVES/INDICATORS FOR LOOKING CLOSELY? Notice everything—Cast a wide net to capture all that you can observe. Revisit—Look/listen/touch again, and see if you can find something new. Use categories—Look for different kinds of features or components. Juxtapose—Look at things side by side; compare, observe relationships. Physically change perspectives—Look from high, low, far away, close up. Building on close observations and explorations of complexity to see the potential for building, tinkering, re/designing, or hacking objects and systems. WHAT ARE THE MOVES/INDICATORS FOR EXPLORING COMPLEXITY? Explore inner workings—Explore how things, ideas and systems work—what are their parts and interactions? Explore points of view—Consider and take different perspectives: What different ways can you look at this? Probe your own perspective—Examine your own assumptions and beliefs. Look back and forward—Explore the histories and possible futures: How did this come to be? Where might it be going? Tinker to explore—Take things apart, put things together, play around with how things work. Investigating the interactions between the various parts and people associated with objects and systems, including the range of values, motivations, and priorities held by the individuals who engage with particular objects and systems. WHAT ARE THE MOVES/INDICATORS FOR FINDING OPPORTUNITY? Envision—Imagine what could be invented, or how things could be changed. Reframe—Rethink, refocus, or re-define a problem, opportunity, or procedure; hack or repurpose how things work. Source resources—Be proactive and creative about finding information, advice, and instruction. Prototype and test—Make models and run tests; try things out to see what works. Make (and draw) plans—Identify steps; sketch what things could look like and how they could work; illustrate ideas & processes.